Salt is more than a flavor jump-start. It is one of the four basic flavors and an essential nutrient that our bodies rightfully crave. 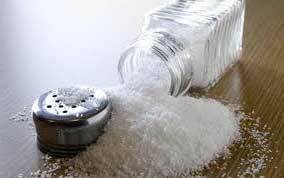 Often incorrectly referred to as sodium, salt consists of 40 percent sodium and 60 percent chloride. While all salts originated from the sea, a number of the major North American salt mines are nowhere near a presently existing ocean. Salt is concentrated in underground deposits in unexpected places such as Kansas, Ohio, and Michigan, which were at one point covered by the ocean. As a general rule, use coarse salt crystals in cooking water or to sprinkle onto or into foods for seasoning. Fine-grained salts are preferred for most baking because they measure and dissolve evenly. Here's a guide to common forms of salt available today.